The Cycladic-style Helianthus Suites- Caldera Caves is located in the picturesque village of Oia, a short walk from the famous sunset viewpoint. Please inform Helianthus Suites- Caldera Caves in advance of your expected arrival time. For this, you can use the special requests section when making the reservation or contact the accommodation directly. The contact details appear on the booking confirmation. The property has no reception. To reach the accommodation, it is necessary to go down a ladder of 95 rungs located on the cliff. For security reasons, children under 13 can not be accommodated for years. Upon check-in, guests must present the credit card used to make the reservation. The name of the cardholder must match the name of the guest in the room. The loft measures 1,55 meters in height, but the kitchen and bathroom have 1,90 meters in height. 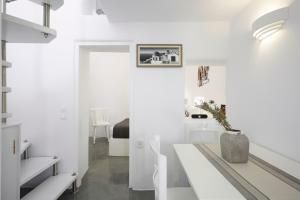 This Cycladic-style cave house has a shared terrace with views of the caldera and the Aegean Sea. The private bathroom includes a built-in shower, slippers and free organic toiletries. Upon arrival, guests will receive a free basket of products. Coco-mat mattresses, free Wi-Fi and a flat-screen satellite TV are included.